In other words, "I don't have anything to say about my running because I'm totally stuck in a plateau but I don't want you to think I've died, or that I don't care about my blog, so instead I'll offer a cop out 'post' and hope you don't notice that it's not a post." Angry Runner schools us on motivation. She's got a point, a good one. I ran today. A cat marathon. I repeat: A CAT MARATHON. Like, cats running 26.2m. Too bad it's a joke. Brooke uses tampons specifically made for sport. Too bad it's not a joke. Julia gets mistaken for a grade schooler, and I laugh. 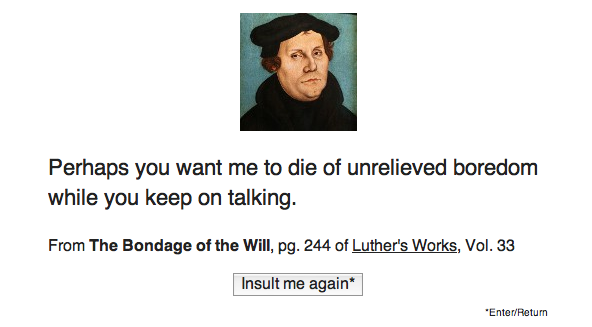 Totally not running related, but the Random Luther Insult Generator is quite awesome. And finally, scientists prove that ice cream is addictive in much the same way as drugs - in other words, I'm screwed. Considering replacing my nightly Edy's with some heroin. Any suggestions for things I should write about to keep my little blog from going gentle into that good night? I think you should write about how pumped you are to be coming up to the Great White North for Around the Bay. Yeah. About that. I'm still coming, no worries, and I'm finishing the race. But my training - um, yeah. Um. Uh. Although I fear my cats would need some kitty body glide for their swaying kitty FUPAs. I'm in love with the Luther insult generator. Thanks for posting it; that was one angry dude.